And all together have a rout. And change it up koool! What’s that you say? What does this poem even mean? Turn yer world view on an ear. We have a fair-full of kind and caring metaphysical folks who have studied their crafts for years in order to offer guests like you new views, new thoughts, and perhaps a change in hopes and expectations. And some stone jewelers, and potions, and custom scents. The Blue Moon Spirit Fair is held at the Maplewood Rock and Gem Club, 8802 196th St SW, Edmonds, WA on the first Sunday of the month. The next fair is–Sunday, April 7, 10am-5pm. At facebook.com/bluemoonspiritpsychicfair/ and bluemoonspirit.com. Free tea. Free parking. Free admission. Welcome! We escaped the North Pole! Celebrate at the Blue Moon Fair Sunday, March 3 10-5 ! Have you been reading any of those articles about the North Pole traveling around recently? It must have booked a two-week special to Seattle and brought its snow bags, ah hem, arriving during our February Blue Moon. If you’d like to have a word or two with those travel agents who sent them here, come to the Blue Moon Psychic fair! What? You really don’t care what the North Pole is up to? How about the South Pole? How about your stars of fortune? Numbers for wealth? Or the next little place you’re gonna look and find LOTS of JOY (or love )!!!! What about Uncle Harry? Is he ever gonna stop smoking those cigars? Or, why do you keep smelling Aunt Mabeleen’s unmistakable Eau de Toledo from the ’80s? It’s dilemmas like these that make us sane people go off into new directions for answers. At the Blue Moon you can find some new directions for insight, answers, and possibilities, and enjoy a great adventure! We have a smorgasbord of talents: palmistry, tarot, astrology, destiny cards, angel healing, emotional code healing, energy healings, scents, runes, all kinds of fun rocks, intuitives, psychics, and mediums. And, free tea! Come visit and browse and sit a spell. Let’s think about spring and wave bye-bye to that fickle North Pole. The Blue Moon Spirit Fair is held at the Maplewood Rock and Gem Club, 8802 196th St SW, Edmonds, WA on the first Sunday of the month. The next fair is–Sunday, March 3, 10am-5pm. At facebook.com/bluemoonspiritpsychicfair/. Free tea. Free parking. Free admission. Welcome! All Hearts on Board! It’s time for the Blue Moon Spirit Fair! The next Blue Moon Spirit Psychic Fair is only 11 little days away from All Hearts Day, which some folks call Valentines and some send out all sorts of chocolately things and even dinosaur cards with hearts on them. Hearts. Hearts are what you’ll find at our cozy fair of wizards and psychics and rock lovers. The best part of going to the Blue Moon is being able to connect with people who “get it”. Sometimes people don’t even know ahead of time why they come. Sometimes we don’t even know why we’re there. It’s just all good. What? A psychic doesn’t know why they are there? Is there a cloud fog in their crystal ball? Did accuweather-for-psychics.not-a-com go down? Perhaps intuition whispered from the ethers, or the “others”, or the great subconscious where Jung used to hang out. Cool places, like a spirit-hangout-dance-floor with angelic jive goin’ on. 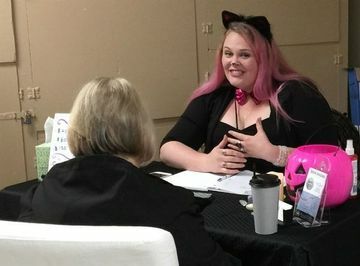 At the Blue Moon Spirit Psychic Fair you will always find first-rate, highly skilled intuitives and craftspeople. Psychics, mediums, animal communicators, runes readers, an astrologer, energy healers, rock lovers and sharers, rock jewelers, a palmist, and, free tea! And….fun! Let’s brrrriinnnnng! in the New Year! It’s time for bells and whistles and shouts and cheers! Why? Why not! Stop in and share your dreams for the New Year. Maybe get some tips to really surf the little waves that may be lining up along your coast. Waves? That’s life! A flat sea is boring anyway, right? A flat sea is like watching the same tv show all day every day…. duhhhnnnn….snooze. But little waves, now that’s what keeps life juicy–views on the crests then times for reflection and change and kickin’ back–that’s a bit of excitement and rest, eh? The beginning of the year is great for new dreams and new plans. Come and share yours! You can meet a marvelously talented group of psychics and healers who care about everybody who comes in the door. They have insights, psychic perceptions, and other metaphysical healing talents that can benefit you and your understandings. The group includes psychics, mediums, aura reading, astrology, palmistry, reiki, runes, skilled energy healing of several types, lotions, essences, stones of many nationalities including our beautiful local wonders, stone jewelry, and more! ….including–free tea! Come visit, grab a warm cuppa, and just relax and have fun. What a nice way to spend some Sunday time. The Blue Moon Spirit Fair is held at the Maplewood Rock and Gem Club, 8802 196th St SW, Edmonds, WA on the first Sunday of the month. Next is–Sunday, Jan. 6, 10am-5pm. On Facebook: https://www.facebook.com/bluemoonspiritpsychicfair/ and meetup . Free tea. Free parking. Free admission. Welcome! What treats do you find at the Blue Moon Spirit fair? Wizards, healers, energy workers, organic healing oils and potions, fun jewelry, and LOTS of rocks (after all, we meet at the rock club). Add in a dash of tarot, palmistry, runes, intuitives, and mediums and you’ve got a delicious mix for a relaxing time. Come sip some free tea and see what it’s all about. The Blue Moon Spirit Fair at 8802 196th St SW, Edmonds, WA. 10am-5pm. Sunday, December 2. On Facebook: https://www.facebook.com/bluemoonspiritpsychicfair/ and on meetup. Free tea. Free parking. Free admission. Welcome! Holidays–it’s a word that makes adults act like children and grab their sleepers, or a glass of wine, or, shop like a person with a big list of to dos. Or, even, reach for the tissue box. .Hmmm…How about some free warm cider and cinnamon, and a relaxing break instead? As for Operation Holidays, maybe ya got an old ootchy-goo hangup to toss out the door and you need the right broom. Maybe it’d be really fun to prepare for some nice new memories. Or even talk about how to handle the ole’ sis or grumpy granpa since you plum ran out of knock-knock jokes, alas. We have lot of smiles and caring and very skilled readers and crafters to share joy and give some alternative eyeglass-looks at life’s little snicketys. Maybe even some new knock-knock jokes, ya never know. Stop in and find out for yourself: reiki, tarot, runes, palmistry, intuitives, mediumship, energy healers, stones, jewelry, lotions, potions, and more! The fair is Sunday, November 4, from 10am-5pm at the Maplewood Rock and Gem Club, 8802 196th St SW, Edmonds, WA. Free tea. Free admission. Lots of free parking. Lots of smiles and sunshine (we’re rainproof). P.S. Here’s some appearances at our October fair, it was a bit other-worldly. Ooooh….portending gooblins and pranksterises and mysterises and fuuunnnn! We got ’em at the Blue Moon Psychic Fair! You’ll find happy leprechans, and fairies, and jokesters, and gypsies, and more than one surprise—because…..we’re wearing costumes!!! Tables just might have little treats to go with the big treats of the skilled delightful people there. 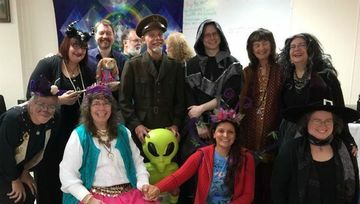 You might find costumed mediums, channelers, reiki healers, energy healers, tarot readers, intuitives who actively talk to higher beings including your guides, and STONES of all shapes and sizes. Also, jewelry, balms, tarot cards, and….come find out! It’s fun! It’s free! Free tea, lots of parking. Sunday, September 2 — It’s a party! Spirited relaxing with free tea. Blooooo Mooooon Psychic Fair! It’s people chatting, talking, picture cards appearing on tables, sips of tea, laughter, people waving their hands in the air. It’s a party! There’s all kinds of helpers hanging around in the ether, too. We only allow the good guys, and they have to wear white hats, or halos, or white elephant ears or antennas, whatever. On the ground team we have Pam, who can help you build a spirit guide team. Debbie shows you your auras. Healers Dr. Todd and Reita adjust body energies for healing. Michelle and her magic scents, mediums Ann and Joelle, artists Karen, April, Lahrinda, Jeffrey, Nicole, channelers Susy and Jeanie and friends, Angel has storied runes, and spirit singers like Miss Lola. Several talents use sweet card decks that help show you what’s going on in your personal sphere. We have several jewelers–check out the design from Jeffrey the Wiz. We’ve even got talking rocks, and even singing ones. Ever had a rock sing to you? Visit us at the Blue Moon Spirit Psychic Fair Sunday, September 2, 10am-5pm. Free tea, free admission, lots of free parking. At the Maplewood Rock and Gem Club, 8802 196th St SW, Edmonds, WA (cross street 88th). On Facebook: https://www.facebook.com/bluemoonspiritpsychicfair/ , webpage: bluemoonspirit.com, and here. You are welcome to stop by! Smiles guaranteed. What’s so Special???? Come find out! Ok, enough parody. Listen up peoples, the Blue Moon fair is gonna be happenin’ on Sunday, August 5. At this here event, we welcome people with smiles and good wishes. It’s a good time had by all, and however you walk in, you’ll leave feeling lighter and brighter–filled with fresh inspirations, outlooks, and thoughts. Maybe you’ll visit one of our fine healers, and leave with less oooches. As an impartial fan, I gotta say I am wowed by the talents that we have here — long time experienced and studied devotees of bringing good to people. Psychic readers, mediums, tonal healers, reiki, energy workers, way above average tarot readers, crafts people who put special love in their creations and charge them up, beautiful art designs on jewelry and cards, lotions, potions, orgonites. Oh yeah, and stones–we really rock! Come check us out! Visit us at the Blue Moon Spirit Psychic Fair Sunday, August 5, 10am-5pm. Free tea, free admission, lots of free parking. At the Maplewood Rock and Gem Club, 8802 196th St SW, Edmonds, WA (cross street 88th). On Facebook: https://www.facebook.com/bluemoonspiritpsychicfair/ and meetup. You are welcome to stop by! Smiles guaranteed. Pop! Ka Bang! Squoosh! zzzzzzz! It’s the July 1 Blue Moon Fair! It’s happenin’ just before that very noisy day that calls attention to inner peace and quietude. To boost that awareness, we’ve got some little poppers to start the day off at 10am! Then everyone will give thanks for no poppers the rest of the day. We’ll just tell the spirits it’s apple cider corks so they don’t scare off, or maybe champagne corks for a few of those esoteric high flyers. Besides the about-to-be holiday-disturbed calm and quiet that you have cultivated in your home and mind, are there perhaps some sneaky nigglies sprouting? Doubts trying to bloom like dandelions? New starts that need some miracle fertilizer? Or maybe you just need a cheering squad or a relaxing afternoon–we got that. When you visit, you’ll find a beautiful variety of healers: energy, reiki, galactic tap-ins. We have amazing psychics, mediums, and tarot readers (I loves ’em). And the crafts–let me tell you, talent! Stones, stone jewelry, galactic tarot cards–and some new greeting cards, astrology–it’s just plain outta this world. We’re here 10am-5pm Sunday July 1 ! Cultivating zen states after the 10am ruckus. The Maplewood Rock and Gem Club, 8802 196th St SW, Edmonds, WA. Come in, relax for a spell and share some smiles, and then venture down the hill to the water and watch the ferries mosey back and forth. Ah, zen. Free admission. Free parking. Free tea. Here’s a quick pic from last month’s stuffies donations. That’s Pete’s cousin in hand! SO IS THE BLUE MOON FAIR! Sunday, June 3, it’s a Blue Moon Spirit Fair! Come and yodel, or dance, or try out your sniffer on these exquisite products from Julie Grey, mistress of tantalizing stone essence healing potions, and extra special–a marvelous psychic. If you only sniff around at mystery theatres then we got a host of other treats–how about a spell of tarot, or energy healing on some of your energy layers–it’s amazing how far out you can go and still be healing the ole’ bod. Or try a healing code fix up, or reiki. Or just be wacky and come in and have fun. You can find aura charts, potions, simple and more involved crafted stone jewelrys, color-filled orgonite dowichys, past lives, horoscopings for insights, palm readings, galactic art and jewelry (Bunny Rose rules! — but don’t tell her human that, or her, for that matter), and rocks, rocks, rocks! Rough, polished, local, not, pyramids, balls, bags–it’s a treasure hunt! Find the one that says, ‘hey, you!’ and you say, ‘what?’, and then…..but I digress. Free tea, free admission, free parking, a smile just for you. Stop in for some relaxation, and then maybe mosey on down the hill to Edmonds for some sea air, sea gulls, and gustatory delights (that’s food to us plebes). P.S. Whose Bunny Rose? That’s a mystery for Sunday, June 3, 10am-5pm, at the Maplewood Rock and Gem Club, 8802 196th St SW, Edmonds, WA (cross street 88th). You are welcome to stop by! Smiles guaranteed. We’re here, we’re there, we’re everywhere! In the clouds, in the zone, in the ozone! And into love and caring and alternative ideas to improving life, love, and the pursuit of whatever pleases your fancy (but we might not want to know all of those, if you know what I mean. hee hee). Come to the fair and meet a lovely group of friendly people with happy smiles. We have specials balms and essences, skilled energy healers, rock charmers with acoutrements (jewelry to us wabbits). Quite a few of us have studied various psychic skills in order to be of finer service, and bring in guides and loving messages and new perspectives on problems–that may turn out to not even be problems when you turn them on their ear. It’s a place for opening up to a bigger and brighter world and a beautiful afternoon. Stop by, relax, and have a cuppa. Free admission, free parking, free tea. Come visit us and let’s hop into April! Sunday, April 1, 10am-5pm is … Easter? (guess again) … April Fools? (guess one more time) … The Blue Moon Spirit Psychic Fair? yay! you got all 3! Bunny Rose Bonsoir, a frequent silent guest, will be doing readings in honor of this special hippity-hop day! Bunny Rose is much more than a delightfully ruffled and well-dressed friend of the Wizard Azanon and Billie St Rose, because Billie channels Bunny’s spirit voice. Bunny Rose is a wise little thing, and fully continues our intentions of smiles and love and fresh thoughts for guests. And what fun! Besides Bunny we have some new orgonites that are mouth-watering from Nicole Bagley, and her lotions and skin cremes. Pamela Bright taps into galactic wisdom songs. Michelle pulls Akashic Records from the file clerks of heaven, and house reiki. We have such skilled intuitives, and card readers. Humorous astrology and art from Tony White, longer chart readings from Ray Couture. And rocks. We got lots of rocks, like crystals, gemstones, and mountain jaspers. Check next week’s post for a fuller listing of who will be there. In the meantime, mark your calenders for a fun and lovely afternoon on Sunday, April 1. Come in, sip some free tea, relax, and listen to what the stars and your guides have to say. Free tea. Free parking. Free admission. 10am-5pm Sunday, April 1. 8802 196th St. SW, Edmonds, WA. Come and have fun! We’ll see if we can’t help you see the light from any planet you have a hankering for. Bring your grandma, and she can find somebody sweet to talk to. What you’ll find is a collection of people who studied for a big part of their lives in ways to help others feel better about what’s going on. We do it with smiles and hugs, and new views on old views. So you walk in blue about something, and then you see it’s really green, or pink, or spotted. It’s all in how you look at it. We have intuitive readers, tarot readers, and animal communicators (what’s Fido really up to?). You’ll find energy healers who work with different layers and levels of energy in your body to adjust that tweak and unwind that squeak. And rocks! We have tables of those hardheads; and jewelry, and orgonites, and scents, and balms. Stop by and visit. Help yourself to some tea from the kitchen counter. Pick a chair and relax, or walk around and ask some of our talented people what is it they do. You will feel welcomed. That’s right! We have whoozits and whats-its and fixits for just about anything that ails you! Not to mention that big double-heart day is coming up. Time to spread some love and cheer! Or just come by and feel it. We’ve got tea and smiles, and guides, and wisdom, and some energy wands and magicians who know how to do abracadabra and put that thingamajiggy back where it’s supposed to be. If the old glasses aren’t seeing such a good picture, or the frames need adjusting, let us help you. We do that kind of magic — what looks bad, isn’t. What looks impossible becomes a hiccup. What seems dreadful, well, turn it around and holy moley, what a blessing. See, we’re about living a better and better and better life. The tools on hand include intuition, tarot, many stones and our (in)famous Mike the Rockman who’s actually a pretty nice guy. Aura drawings from Debbie, the Wizard of Alanon’s been hard at work, and you might not have heard (yet) about some of our new and extremely talented psychics. Jewelry, Reiki, a Vibrational Singer, astrology, palmistry and more! Here’s a couple caring fun-lovers, Alanna our Earth-Mother tarot reader, and Tony–an astrological cartoonist. Alanna’s been a tarot reader for over 30 years, and is also trained in Theta healing and therapeutic hypnosis, plus others. ‘Tony White is an astrological artist, card reader and counselor who, assisted by his wife Saille, uses a number of unique techniques to help clients remember the important soul lessons and experiences they’ve chosen to bring into their current lifetimes. Come visit, relax, see what all the hubbub’s about. We’re fun and friendly and so enjoy your company. Free tea. Free parking. Free admission. 8802 196th St SW, Edmonds, WA. 10am-5pm. Sunday, February 4. On Facebook: https://www.facebook.com/bluemoonspiritpsychicfair/ , meetup, and here. Welcome! Push out the old, Dance with the New! We’ll be there to help you welcome in new dreams! Let’s talk about the life you want to be living, and do a little energy-shifting. Dreams are free, and they foster intentions. Guess what intentions create? “I can’t do that,” you say, “I have to climb Mt. Everest first.” Well, let me tell you little secret about Mt. Everest…. Nuh unh, you have to come to the fair and ask. hee hee. What you need, is a cup of tea, and some time to relax. We’ll put a little bucket by the door where you can drop your worries before you come in. Then, when you need to talk about them, you can run grab them, and bring them out in their full cookie monster horror. Yup, we all have ’em. Let us help you put some frosting on them, give you a boost, and help you see that spring is coming. Whatever it is outside, it’ll be warm inside with us. We’ve got some new peoples this time as well as many of our regular very skilled readers. New peoples include reiki, a new stones table, and some new readers. Come get your aura picture taken, see what changes emotions make in it. Do you have an ornery chameleon you want to talk to? Got a question? Come and get some fresh insights. Sunday, January 7, 10am-5pm, 8809 196th St SW, Edmonds, WA. Free tea. Free admission. Free parking. Sunday Dec. 3 – it’s happy time! Sunday, December 3, a day for love! You might hear a jingle or two, but that’s because bells are fun! Bring a smile and maybe a red and white hat and share the beauty of your being with us. It’s our favorite part of every fair. Come in, relax, find refuge. Admire the fireplace, which will not have a fire in it alas, but it is quite unique and beautiful. This month has some new treats, and the talents get even better. We’ll have free hot tea and cider. I personally hope to see some elves and fairies tip-toeing around but they’re pretty sneaky critters. It’s a place to feel good, and then better. Beautiful crafts, loving wise psychics, a happy hostess, and many welcomes. Draw a free card for a spot read. Ask anyone about what they do–each of us has our own gifts, and it’s always fun to share. Free parking, free admission. Excellent healers: reiki, shaman, energy, essential waters, tarot, other card decks, other healing tools. On Facebook: https://www.facebook.com/bluemoonspiritpsychicfair/ , and Meetup: Blue Moon Fair https://www.meetup.com/Blue-Moon-Spirit-Psychic-Fair/events/236310846/ . Welcome! Friends, families, pets, rocks, yards, the sky, the moon, a bobblehead doll — it is feelings of connection that reassure us of our place in the world. No matter what your family of support looks like or sounds like, this is a good month to crow to yourself about your gratitude. Speaking of crow, Joe the Crow is out in the yard with all his buddies, who are also called Joe. There’s a lot of Joes out there. They eat a lot of peanuts. They make me smile and feel good. And I see them and it’s a glad feeling, and fun, and rich, and warm, and I freaking feel feathery daggone good! See, Joes are part of my family. And rocks. And friends, and fairs and the very cool people who are at the fairs, both the ones at tables and the ones who come to visit. It’s a wonderful way to spend a day. Come see who’s new and what’s new at the fair. We have some new outta sight readers, not to mention the vibe-tuned ones who hold our space and are also constantly growing. Our craftspeople have been busy! Come rock and roll, and bask in the glow of caring, laughter, and love. Free tea. Free parking. This Sunday, November 5, 10am-5pm at the Maplewood Rock Club, 8802 196th Street, SW, Edmonds, WA. Blue Moon Fair Oct. 1–A time for happy spirits! Sunday, October 1, 10am-5pm at the Maplewood Rock Club on 196th Street by Edmonds. We’re spirited! And, it’s fall! Yay rain! Come celebrate the season. See what little goblins are hanging around to bring you joy! Get a reading, get a healing, get refreshed! Have some free peach tea. We have several tables of rocks looking for their proper homes, and they will happily converse with you — we won’t tell, we do it too ;-). The whole world is magic! October is a month of magic. Start it off with a smile and a freshened outlook on your life. Free parking, free admission. Excellent healers: reiki, shaman, energy, essential waters, tarot, other card decks, other healing tools. Also, intuitive readers and angelic workers, and perceptions for questions on career, romance, health, next life steps, healing to leave the past in the backyard, as we love our planet. On meetup: Blue Moon Fair, Facebook:https://www.facebook.com/bluemoonspiritpsychicfair/ , and here. Welcome! Sunday, September 3, Blue Moon Spirit Psychic Fair !!!! Some people say there is no yesterday, some say no tomorrow. Who cares? It’s all about NOW ! Who’s groovin’? If you can’t find THE moment, the now, the “being here” feelin’ and you just keep waiting for it to jump up at you like a frog — we’ve got frog finders! Of course, sometimes we find a cat instead….but, that’s life, right? Practical, caring mystique lies within these walls. And also years of learned application in the healing arts. We can open windows to what was, what can be, what’s next? And the best yet – the Wow of Now. It’s all about your magic! We might look like everyday people who might have gifts, that’s because, we are, and we do! But the real magic lies in you. We’ve got some keys to open windows to your own personal mystiques. Didn’t know you had some? Ahhhh…..but you do. It’s the same world you’ve always lived in, but we’ll give you some new filters to view it from. And life becomes more and more palatable, and something to savor. Sunday, September 3, 2017, 10am-5pm, 8802 196th St SW, Edmonds, WA (NW corner of cross street 88th). Sunday, August 6, Blue Moon Spirit Psychic Fair !!!! Ho! Ho! Ho! Wait a minute, wrong holiday…. Drumroll—-It’s August in the swinging ole summertime, with a great BIG eclipse on its way on August 21! What does that mean? Is a mothership gonna park overhead and lower a ramp and become a new shopping mall? Stop by the Blue Moon Spirit Psychic Fair on Sunday, August 6 and find out! Hmm, but we probably don’t know either. What we do know is a lot of other good stuff–helpful ways to feel better in your everyday life, how to shift your body’s energies to increase your energy levels and feel more healthy, how to let go of garbage and throw it on the truck, and good stuff about life’s mysteries. We’ve got caring, talented psychics, amazing healers, marvelous handcrafted energy tools, and, just-in-time-for-the-eclipse, Jeffrey the Wizard Azanon’s amazing and beautiful Lightbody Ascension Amulet and other jewelry delights. If you’d like to know what that is for, stop by and ask. Summertime! And the crickets are singing….somewhere. We’re celebrating ‘just being’ at the Blue Moon Spirit Psychic Fair, Sunday, July 2! Being what? Well, psychics, craftspeople, artists, healers, helpers, givers, laughing, smiles. Any ole’ good thing. Need a bit of cheer? or a helpful insight? We can tell you how special you are. How about a new stone or jewelry piece that you later realize drew you to the fair? Did you know that stones talk? Want to know what your hamster’s thinking? (beside “more corn”) Or why that one little finger is a little crooked? Does somebody visit in your dreams but insists on being mysterious? We love that stuff. Come join us and relax. We have free tea and lots of seats and if you haven’t been to a fair before, just ask any of us what the heck we do. Stop by, 10am-5pm, 8802 196th St. SW, Edmonds, WA. Check it out! It’s almost summer, and time to play! Come by for a pick me up reading, or get that thing-a-ma-witchet mean energy removed from your toe. Lovely Janine will spill Fido’s secrets, Gena will get mom to tell you things she wouldn’t when she was alive (and you had no idea!). Our new reader Kate is a treat to sit with. Our wizard’s art is out of this world, orgonites that will activate your pineal gland (yes, you got one). Rockman Mike… silk acoutrements by Lois, skilled tarot comforts. Heck, find out secrets from your own secret [Akashic] files from Kelly! There’s so many more talents. And, best of all—free tea! You’re guaranteed a few smiles when you stop by and chat. See you Sunday, June 4! 10am-5pm, Blue Moon Spirit Psychic Fair, 8802 196th Street (cross street 80th at the top of the hill), Edmonds, WA. You can’t miss the new pink fence banners! Lovely spring is in full bloom. How about you? Come to a place where everybody smiles, and only encouraging words are heard. Gain insights from intuitive messages. Relieve stress and pain from reiki and other energy healing. Find out about shenanigans your parents pulled and never actually told you–those rascals. It just goes to show, we’re all just people. Enjoyment galore. Where? At the fair. The Blue Moon Spirit Psychic Fair. Calling all seekers and people with questions about what’s what, where’m I goin’? It’s spring, things are waking up. Your peepers want to know–what shall I get into next? We can help. With caring and sharing and a little help from some spirit guides, or massaging your energy fields, or a peek at some akashic records or questions to somebody who’s passed. It’s sweet, it’s fun, it’s purely from the heart. Luuuvvvv is in the air! Luv is up, luv is down, luv is all around. We’ll have some here, for everyone. Let’s share. This Sunday, Feb. 5, 10-5 pm. It’s a Superbowl Escape! The Blue Moon Spirit Psychic Fair. 7-8 pm A Crystal Bowl Love Vibrations Concert by healer Nanci Drew! It’s like a sound massage. Welcome to the Blue Moon Spirit Psychic Fair in Edmonds! The first Sunday of the month, 10-5, at 8802 196th St SW, Edmonds, WA. Join masterful multi-dimensional healer Nanci Drew as she evokes hauntingly beautiful sounds from a delicious and varied collection of crystal bowls. Each bowl is created to vibrate at a particular sound frequency, and awakens different areas of your brain and your being. The experience is like bathing in sound, and feeling different parts of your body become activated. It is a peaceful pleasure that is phenomenal and is increasingly used by alternative healers for many beneficial effects. Doors open at 6:30pm with an informal discussion. The concert is 7:00-8:00 pm. $10 at the door. Sunday, Feb. 5, a day to embrace love! You are invited to come by for a cup of tea and a visit to our Blue Moon Spirit Psychic Fair, 10-5! Here’s an idea–come by the fair, go out for a bite, and come back for the concert–we’ll have maps of close by eateries. Come visit and let’s talk about whatever’s on your mind–love, politics, changing the world, your hamster, past lives, future ones, winning lottery numbers…whatever. Enjoy comraderie, laughs, some browsing and shopping, and any insights that might appeal to you. It’s a good day for a hot cup of tea. Free parking, free admission. Excellent healers: reiki, shaman, energy, essential waters, tarot, other card decks, other healing tools like massage (hmmm), and some knock-your-socks-off new orgon designs and Mother Earth’s stones and stone jewelry on several tables. As for love? Ask, delve, seek, explore, immerse yourself, we’re there to care and share. The first Sundays in 2017! Feb. 5, March 5, April 2, May 7, June 4, July 2, Aug. 8, Sept. 3, Oct. 10, Nov. 5, Dec. 3. Sundays, 10-5, at 8802 196th St SW, Edmonds, WA. Cross street 88th, it’s at the top of the hill as you look down at Edmonds and the Sound. Stop in and visit. Have a relaxing cup of tea. Find out why the energy around may have seemed wonky lately, or how to unkink the energy block in your whatsis. Learn more about other ways to heal, or perceive new information. Listen to your guides as they speak through a loving communicator. We offer love and light, and truly wish for blessings for every lovely soul who visits and for everyone and everything on our wonderful planet. Love these healers–it’s my privilege to be there with them. I am your host, and will also have my own table of wire wrap stones and simply stones, because, after all, Rocks Rock! I’ll read a stone from the table for you, and can do 5 minute readings too. Here’s some of the fun we had for Halloween 2016! Coming up: the last 2016 fair is Sunday Nov. 27.